Hidden microphones are used to hear conversations but are sometimes easily discovered unless . . . you deploy our covert lighter transmitter. Using our covert transmitter, you can walk into a meeting and broadcast what was said to your partner nearby. This covert transmitter can be worn on your person, placed in a backpack, on the table, or anywhere you want to capture a conversation. 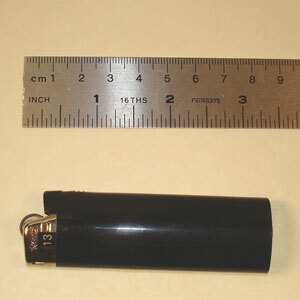 A butane lighter houses the covert audio bug and hidden microphone, which pick up not only conversations, but acoustic sounds nearby. Need to know if someone is coughing as a signal to call for help? Once activated, the covert transmitters are able to send conversations toward a radio receiver that can either be monitored by a surveillance team or connected to surveillance recorders and make audio surveillance recordings of conversations for storage and future review.